Chandra Dev, as a God, is fair and youthful in appearance. He is considered wise, peaceful and auspicious. 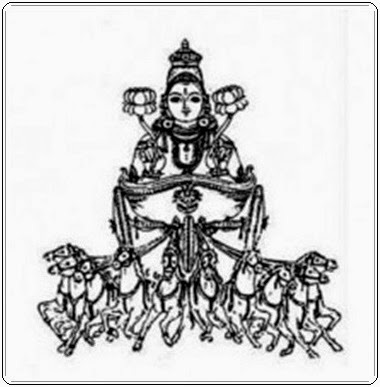 He wears white and carries a mace in one hand and is seated on a lotus which is carried by a shining white chariot pulled by white horses. The Moon rules the zodiac sign of Cancer. The gemstone of Moon is Moonstone and Pearls. The metal representing Moon is silver and direction is northwest. The day representing Moon is Monday. An afflicted Moon may mean personality disorders, difficulties in relating to other people and emotional disturbances. In case of afflictions the mantras of Chandra can be recited or other remedies can be done.